I’ll be honest, other than at a restaurant or paired alongside the casual fruit and cheese platter, I was never a food and wine kind of guy. That’s all changed in 2010. More and more, I’m finding myself pouring through the pages of Food & Wine or Wine Spectator hoping to find the perfect pairing. 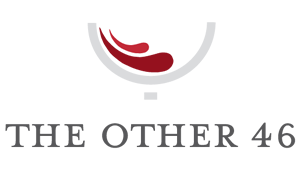 As a result, I hope to share more pairing suggestions this year and have included a new “pairings” category under “wine” for quick access. 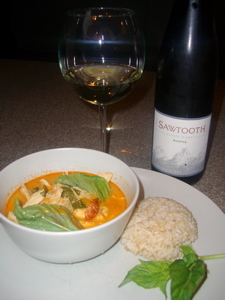 In support of my new goal, tonight’s dinner featured a 2008 Sawtooth Riesling paired alongside a Thai Curry dish. The 100% Estate Riesling is produced by Sawtooth Winery, located in the heart of the Snake River AVA in Idaho. I’ve highlighted Sawtooth in the past (read more here) and frequently recommend to friends and family looking for a wine from the other 46 states. Widely available at a number of retail outlets for $9.99, Sawtooth produced 1,960 cases of the 2008 Riesling. Showing the typical apple, pear, and peach on the nose, the off-dry, medium-bodied Riesling proved to be a great match next to the spicy dish. A delicious wine on its own, but even better with food. Cheers! Pairing food and wine is a lot of fun! I especially love the sweet/spicy combo like you did here. What’s your favorite food pairing? Agreed, this is a very good QPR wine from Idaho that’s easy to find. That pairing sounds good too. “Idaho is more than just potatoes”, says the wine grapes! That’s a tough question. I have to go with a grilled ribeye steak and a bottle of Cabernet Sauvignon. You?